Frankfurt am Main, where the ECB is located, is Germany’s most international city. It has a population of 700,000 and is situated on the river Main. Various cultural attractions, leisure facilities and green areas make the city a pleasant place to live. An extensive road and rail network connects the city to the rest of the country. Its easily accessible airport is Europe’s second largest, with 56 million travellers passing through every year. The open and hospitable atmosphere in Frankfurt stems from its centuries-old role as a trading centre. No matter where you come from, you will always meet people in Frankfurt, and especially at the ECB, who speak your language. You will probably even find a restaurant that serves your favourite food! For many of its staff, working at the ECB means leaving “home” behind. Living in the new environment may put a strain on family life. It may also make solving problems “back home” more difficult. Certainly, being an expatriate has its challenges. The ECB offers a range of sports and social activities for its staff and their families. This helps with integration at work and in everyday life in Germany. Once in Frankfurt, your spouse can join the ECB Spouses and Partner Network which is an informal social group for spouses and partners of ECB staff members. It was set up as an independent initiative by the spouses / partners in order to offer a way to socialise, getting to know new people and pass on experience. Your spouse / recognised partner can register for the Professional Orientation Programme which is designed to assist him / her to prepare for the German employment market. Please note, however, that it does not offer or guarantee employment. In addition, we support language learning for you and your family by partially reimbursing expenses for privately-organised language courses. Children from three months to six years may attend one of the six childcare facilities that are managed by external providers for the ECB. Staff on contracts longer than 12 months may enrol their children in one of these childcare facilities. They have long opening hours which cover the ECB’s working day. At times, the demand might be higher than the supply of places and there is a waiting list, so make sure to register your child as soon as possible. The childcare facilities are co-financed by the City of Frankfurt am Main, the ECB and staff members. The ECB also provides information on other childcare services. For children of four years or more, the European School in Frankfurt (ESF), offers a diverse and stimulating learning environment. It starts with the pre-primary, continues with the primary and secondary cycles, leading ultimately to the European baccalaureate qualification. It is an official educational establishment controlled jointly by the governments of the European Union countries. The ESF offers four language sections (German, English, French and Italian) and mother tongue tuition in all EU languages. As an ECB staff member with a contract for more than 12 months you are exempt from paying tuition fees, but extra-curricular activities and meals must be paid for. There are restricted traffic zones/low emission zones within the city centre (Umweltzone/green zone) where only cars having specific environmental badges/stickers (Feinstaub-Plaketten) are allowed to circulate. The badges/stickers can be obtained for €5 at the Kfz-Zulassungsstelle, in the Bürgerämter in Frankfurt, at TÜV, DEKRA and car garages. You will need to bring your car ID (Fahrzeugschein) in order to buy them. Vehicles without an environmental badge/sticker may not pass through the green zone and penalties apply. You can obtain information on commercial banks and insurance companies, as well as on how to register with local authorities or change your car number plate, etc. at our in-house Staff Info Point in room HS 15.10 of the main building. Opening hours are Mondays to Fridays from 9:00 to 13:00 CET. Spread across both sides of the river Main, there is a unique cultural mile, known as the Museumsufer, which is host to 13 museums. On sunny days, the path along the river is swarming with walkers, roller-skaters and cyclists. On Saturdays, flea market traders set up their stalls here. Although Frankfurt is famous for its Skyline, it is also one of the greenest cities in Europe. The circular trail in its green belt has just been named the “most beautiful hiking trail” of all urban trails in Germany. There are 1,625 doctors and 557 dentists in the Frankfurt area, many of whom speak English. Frankfurt is the economic and geographical centre of the Frankfurt Rhine-Main Region. This metropolitan area consists of the cities of Darmstadt, Frankfurt, Mainz and Wiesbaden. It has a combined population of about 5.8 million people. 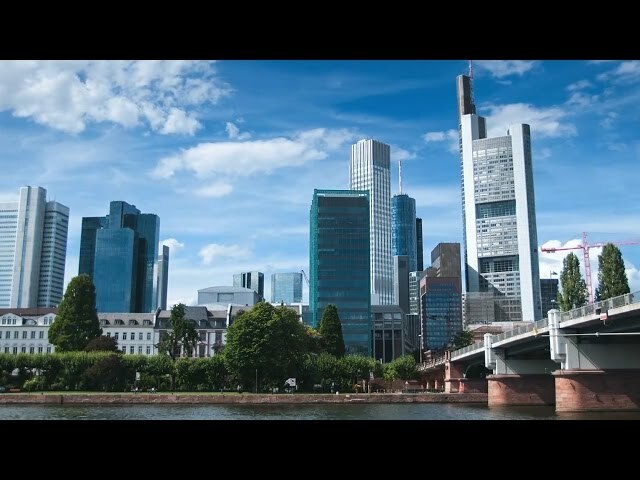 In Frankfurt, there are approximately 60,000 companies of various sizes, which provide around 650,000 jobs. Frankfurt generates about a quarter of the gross internal product of the State of Hesse, which covers an area of approximately 21,100 km2 and has a population of over 6 million. Of this, Frankfurt covers 248 km2 and has a population of 700,000. The capital of Hesse is not Frankfurt, but Wiesbaden, which is located approximately 40 km from Frankfurt. Wiesbaden is one of the oldest spa towns in Europe and has 14 hot springs that are still flowing. The Russian author, Fyodor Dostoyevsky, allegedly lost his travel money in Wiesbaden’s Spielbank casino in 1865. This experience is said to have become the inspiration of his novel “The Gambler”. Hesse is located at the very heart of Europe. Between 2007, when Bulgaria and Romania joined the European Union, and 2013, when Croatia acceded to the EU, the geographical centre was located at Meerholz, a district in the town of Gelnhausen, which lies about 50 km from Frankfurt. Since July 2013, the “centre” of the EU can be found at Westerngrund, a Bavarian town that lies around 55 km from Frankfurt. The Frankfurt Goethe University is among the top international research universities in the world and offers a wide variety of academic programmes. Since 1914, 19 Nobel laureates have worked or studied there.